The current presidental election cycle is unlike any I’ve seen in my nearly 39 years on planet earth. It’s like a horror circus train wreck–you can’t help but watch, even if it makes you puke in your mouth a little and makes you afraid to sleep at night. Everyone was already on edge before the Republican and Democratic national conventions. Now, everyone’s head is about to explode with fear. Apparently, if either Clinton or Trump get elected (and one of them will), the world is going to implode. So either we’re all screwed, or we’re all severely overreacting. I believe it’s the latter. 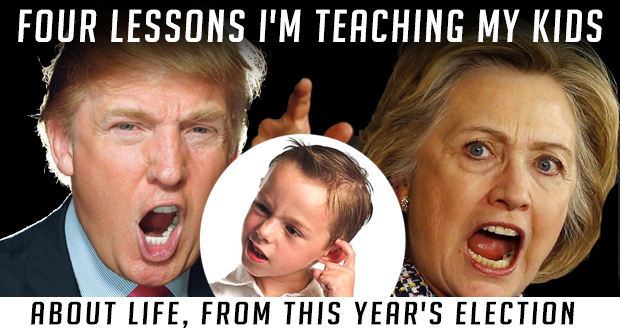 In the midst of all the propaganda, the mud-slinging, and debating, there’s a wonderful opportunity to teach our kids some important lessons that will serve them well in all areas of life, not just politics. First, character matters. Melania Trump plagiarizes a speech by Michelle Obama, and many conservatives give her a pass. The DNC colludes with the Clinton campaign to sabotage Bernie Sanders’ campaign during the primaries, and her supports say, “So what?” When did we suddenly become OK with stealing intellectual property and cheating? If our kids are caught cheating in school, they fail the assignment. If they’re caught plagiarizing, they get expelled. 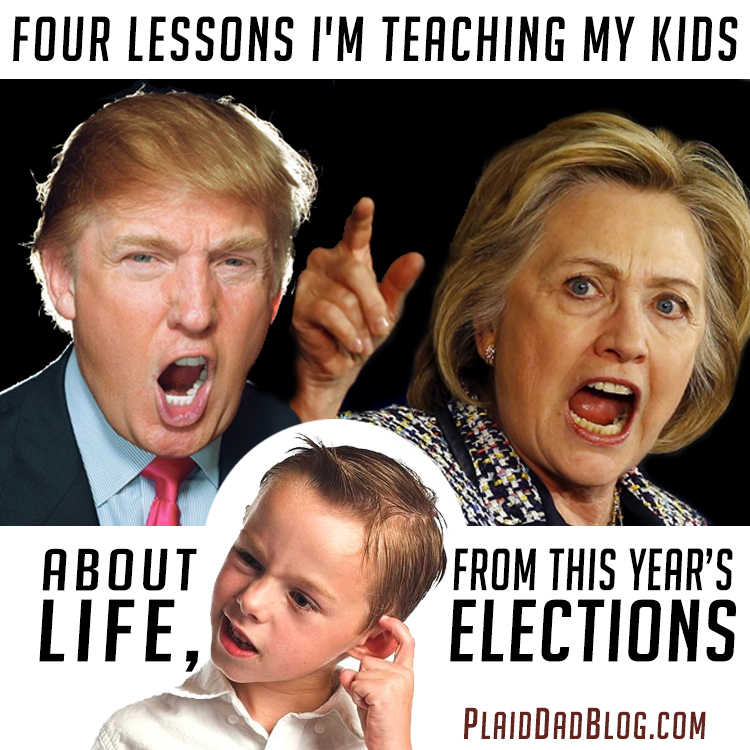 How can we tell our children not to steal, lie, and cheat and then turn around and give our politicians a pass? We shouldn’t. Character matters in everything you do in life, even in a profession like politics where so little integrity is expected. Second, fear is a terrible motivator. I’m beyond tired of people using fear to convince me how I should vote. Here’s the deal–it’s my vote, and I will vote for the candidate I believe best represents me. I will not vote for one candidate because they’re slightly less worse than the other. If I decide to vote for a third party candidate, I will not be dissuaded from doing so because some think that’s a “wasted vote” (it’s not). Consider all the candidates, even the third party candidates. If you cannot in good conscience vote for either of the major party candidates, vote for a third party candidate you can get behind. Don’t like any of them? Then leave it blank–and remember, there’s way more to vote for than president. What can be said of the election can be said of life in general. There’s a lot of things that rouse fear. We can either react to it, or be proactive. The latter is usually preferable. Third, be gracious to others who disagree. Politics and social media are a volatile mix. I’ve seen people’s motives questioned and character nearly assassinated simply because of who they plan to vote for. Feel free to disagree with others all you want, but do so with grace. Refrain from using fear of a hypothetical national apocalypse in order to influence bully others into voting like you do. Don’t get sucked into tearing down a person with whom you agree. If they want to act the fool, that’s on them. Discuss the issues, defend your stance, but do so with class and tact. Fourth, actions speak louder than words (and votes). Why is it that we think the president can solve our nation’s myriad of problems? Its almost like we see him as a (dare I say it) messiah. Instead of passing the buck to elected officials do change what we thing needs changing, how about we vote and work for the change we wish to see? For example, many people I know (including myself) are pro-life. They will not vote for candidates for any office who are not pro-life. That’s fine. But what are we doing beyond voting for pro-life candidates? Are we supporting at-risk women? Are we involved in foster care and adoption, or supporting those who are with our time and finances? If we aren’t, if we just vote, then are we really pro-life? I humbly suggest such a person is only pro-birth. What’s true for the political process is true in all areas of life. Dont’ just talk about change. Work for the change you want to see. 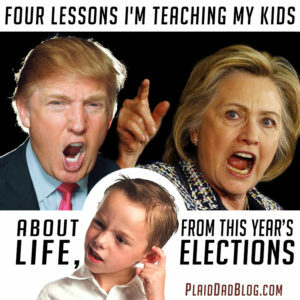 I’m sure there are more life lessons we could learn from this election. Do you have some? Sound off in the comments. For now, I’m going to pop some popcorn and watch this electoral train wreck blunder off the cliff.